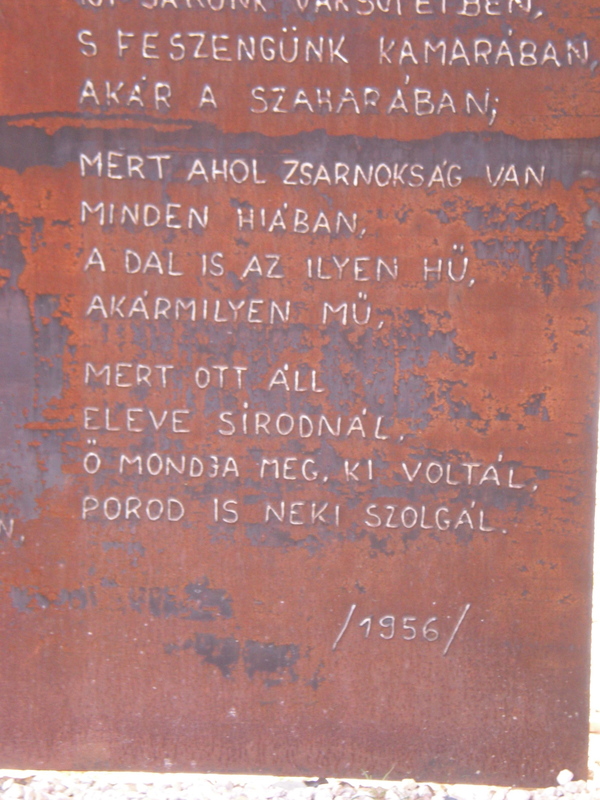 For a very short background on the Hungarian revolution of 1956, read my previous post. 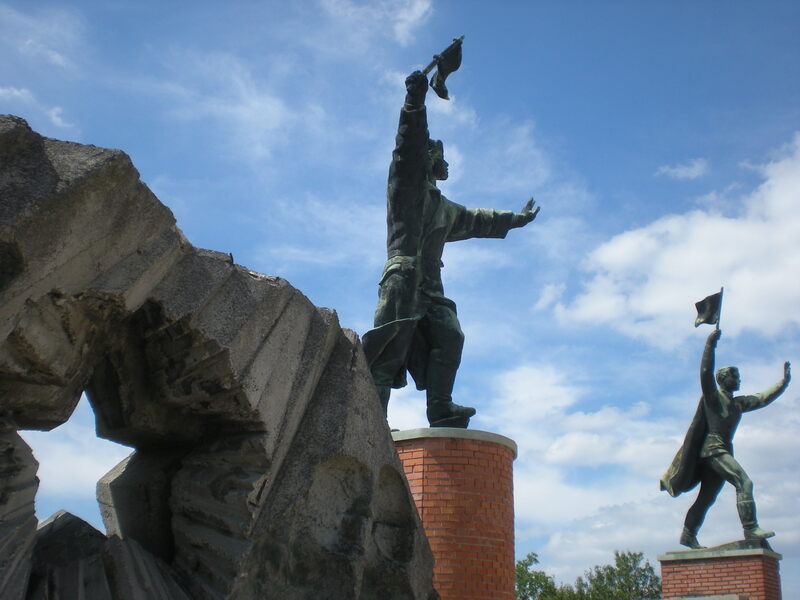 So, after the fall of communism in 1989, the first things to be removed were the pro-communist, pro-soviet statues. 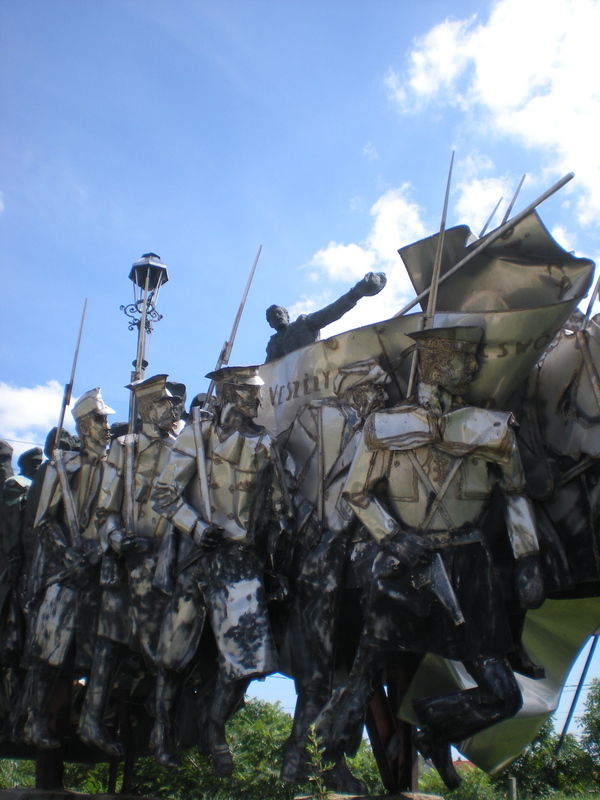 In most former-communist countries, these statutes were destroyed, and understandably so, as there is satisfaction in destroying the symbols of any oppressor. 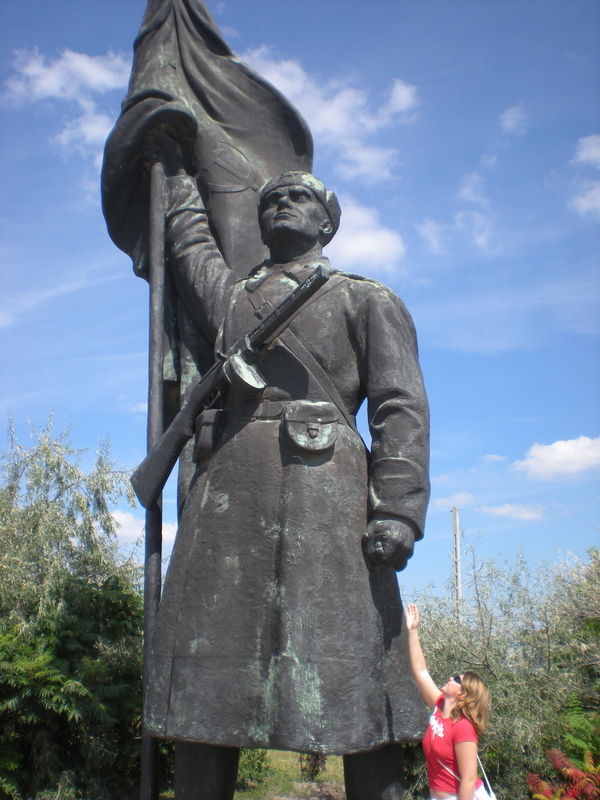 Hungarians had the foresight to save many of these statues, however, and in doing such, laid collection for what would become Memento Park (Szoborpark or Statue Park). 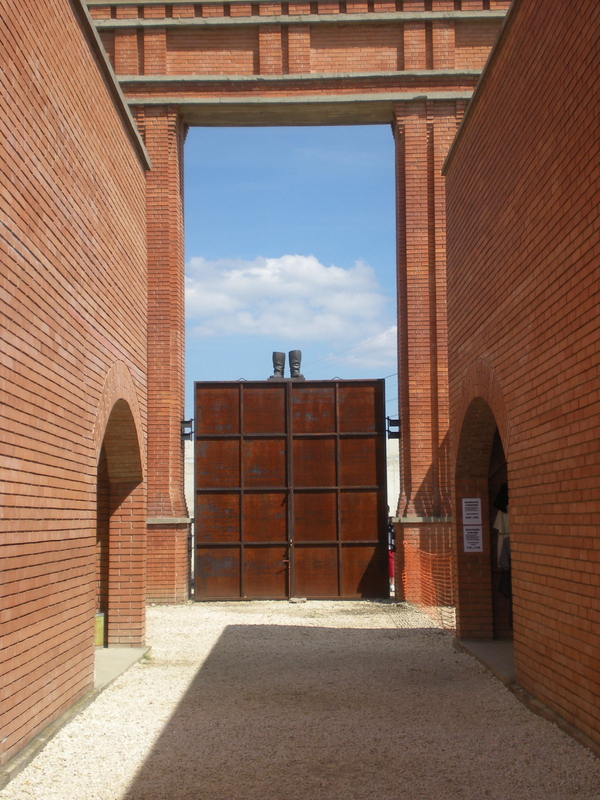 With Stalin’s boots promptly displayed on a re-created Grand Stand at the entrance, and statues of Marx, Engels, Lenin, and Hungarian communists like Béla Kun, this outdoor museum, for obvious reasons, is an extremely popular tourist attraction in Budapest’s XXII district. But since this blog isn’t funded by the Hungarian Board of Tourism, I don’t feel like I need to really go the route of most other Budapest tourist websites or logs in proclaiming it as a stunning must-see. Not that I discourage anyone from going. Quite to the contrary. At only 1,500 forints ($9.50), it’s really worth an afternoon trip. But be prepared. The atmosphere is a little bit, well, creepy, especially if you are there with Hungarians who have any memories before 1989. We arrived around 1pm. It was sunny and hot but not humid, a really typical August day here, and a relief from all of the rain we have been getting. It’s kind of a miracle we even found it, as the only sign for the park was at the entrance itself, as the roadside billboards were dedicated to Ikea and the various Superduper supermarkets, Tesco, Auchan, etc. At the ticket stand, a middle-aged woman emerged from behind the cloud of smoke and communist-era children songs playing what must have been a little too loud for her comfort. From behind her smoke and song reddened eyes, she calmly took our forints and gave us our tickets. The bathroom is around the corner. The bus for Pest leaves at 5. I’m not sure what we were expecting. But there they were: the soviet-era statues wrapped around a winding path, smack in the middle of a quiet Budapest neighborhood. Frankly, it was almost suburban, (that is if those sculptures at the park you take your kids to every day are actually giant sized dying martyrs or crumbling plaques proclaiming the everlasting and loyal friendship between soviets and your home country). We didn’t really know what to do, and probably our behavior reflected the uncertainty of what we were seeing and feeling. We took funny pictures holding hands with Lenin. 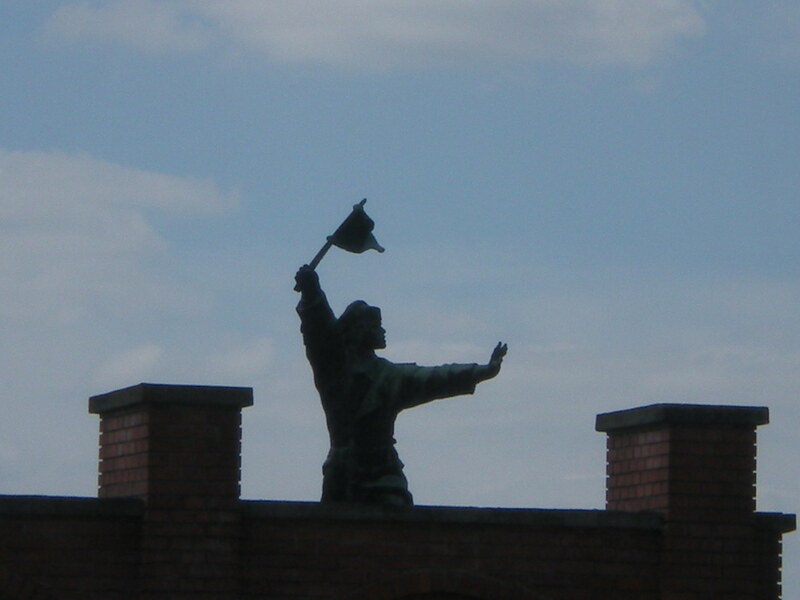 We giggled at the pigeons balancing on the swords of the soviet troops. For me, I really had no connection to the statues or the era, and for the Hungarians, their feelings were mixed enough to spend the afternoon with me in this mood. But on the way out, with the boots of Stalin in the foreground and the soviet star pierced into the road blocks, we stopped to look at what many others had stopped to quietly read: a poem carved into the iron gate by Gyula Illyés: Egy mondat a zsarnokságról (A Sentence About Tyranny) ending with the date: 1956. In the car on the ride home I started scrolling through the pictures that I had taken. After a long silence, the park took its real affect. As is usual when I know I’m going to write about something, I take notes in the trusty moleskine or record interviews or write out conversations for later posting or plotting or poeming. But for reasons I stated in my past post, and because I suppose it is the only thing I can do to prevent myself from attaching my ever pulsing light at the top of the hill American lens here, I’ve decided to simply transcribe the interview after Memento Park, as is. J: So you must have some memories, though. You were nine when communism fell. G: I remember that when we started school, we became kisdobosok, which is young or little drummer. It meant we had to take an oath in a special uniform: white shirt, blue trousers or skirts, special belt and whistle. J: What was the oath? G: It included six points but I can’t remember them all. It was all of the points about how we swore to be loyal members of the society, how we would do whatever our parents said, how we prepared to be úttörők. G: The whole system was divided into two parts. In primary school was the kisdobos and from 5th grade to the 8th was the úttörő. And the uniform, from what I can remember, was exactly the same, but the úttörő was red, like real socialists. Or communists, rather. J: I’m trying to think of something comparable in the United States. I mean it seems stupid but the only thing I can think of is like the Boy Scouts or something. G: So yeah it can be compared the same, because scouts have an oath too, and they have things to do, for nature or the community. They go to camps. They spend time with each other. The have tasks to do. They live a healthy life. J: This is like a pinko endorsement of the scouts. I’m sure they would be thrilled. G: Uh huh. But it was weird because you had a little id. A little kisdobos id. J: What kind of id? G: I can show you an example of one later. J: Ok so the main thing I was wondering about was your experience there. Because I know from my perspective it’s really historical and sort of like I’m looking at history in a lab, distilled. But what is your reaction? G: Yes it’s difficult because, um, I really didn’t consider myself as being a significant part of this ideology, but it was weird to be there. It felt a little bit bad and sad and depressing because it’s something that we are ashamed of. Or what you don’t want to remember. J: So why do you think that if people don’t want to remember it, I mean, why is it there at all? G: Because it can be considered as a museum. But I think it was built mainly for the tourists who came to Hungary as a big socialist or communist country and isn’t anymore and it’s surprising. So maybe it’s fun for them to find a little piece of socialism or communism. That’s why it was a little bit weird. I didn’t have good feelings to go there. And I was a little bit hurt because I knew that people went there because probably it’s a little bit funny for them. But for me it’s more depressing. I mean I don’t remember many things but this feeling is still inside of me. And yes, we can get rid of the statues, of the symbols, of the red stars or all of these things, but in our hearts it stuck a little bit. J: What would you say to someone who wanted to know what it was like or if they should go? G: The statues themselves can be fascinating. And probably, for people who didn’t live in this era, they’re just statues.